Greek Chicken Salad and homemade Peanut Butter Cups come together in no time thanks to Prep Dish- a meal plan service to save you time and encourages healthy eating! I am so excited to share these two delicious recipes with you today courtesy of Prep Dish! Prep Dish is a meal plan subscription company that send weekly Paleo and Gluten Free plans straight to your inbox. You don't eat paleo or gluten-free? Me neither but the meals are real food meals that can be eaten by everyone. Each week, you will get a meal plan that includes seasonal ingredients that help save you time through the week and are delicious. They can help you save money by thinking through which ingredients you need and how much of each ingredient so that you do not have food waste. Oh my goodness! These Peanut Butter Cups are amazing! Each week, you get a printable grocery list and instructions for meal prep which takes about 2 hours and will provide meals all week long. If you have someone to help you meal prep, it will take about an hour or hour and a half. My favorite part about the service: it is created by registered dietitian Allison Schaaf- because it is created by a RDN and trained chef, you can trust that your meals are balanced and nutritious! 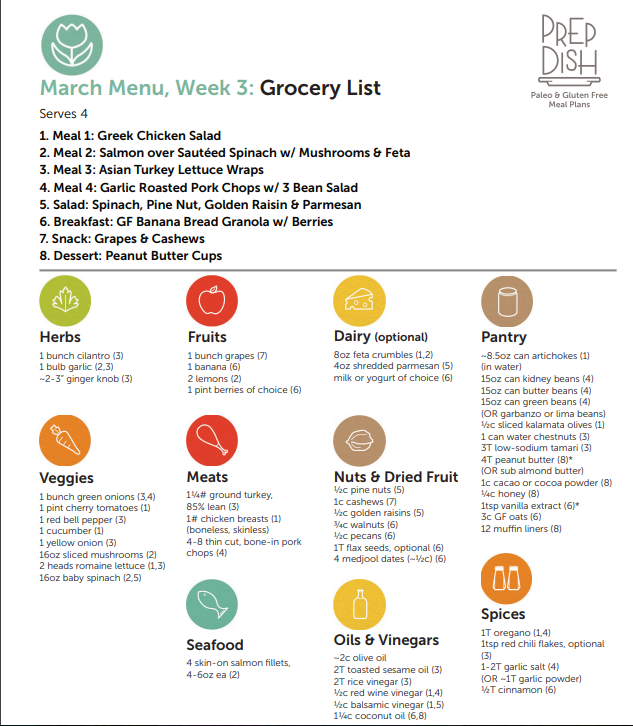 When looking through the meal plans for the month of March, I fell in love with week 3 of the gluten-free menu. There were so many things that I wanted to make: Greek Chicken Salad, Asian Turkey Lettuce Wraps, Banana Bread Granola with Berries and Homemade Peanut Butter Cups especially caught my eye. What an amazing menu! I found the grocery list to be very helpful as it is divided into sections such as dairy, fruits, pantry, etc. I printed out the list and crossed off which items that I already had at home so that I didn't have to buy everything if I already had it. When I meal prep, I seriously am cooking like five items at once which is one of the things that I love about Prep Dish. It gives you the instructions to do different steps at once so it is not just one recipe at a time which ends up saving a ton of time. The day where you make a bunch of the food is called Prep Day and the day when you eat the meals is called Dish Day. There are separate instructions for Dish Day such as reheating food, tossing with dressing, etc. Prep Dish has you cooking most of the food ahead of time so that on the day you eat it, there is not much work left to be done. I made the Greek Chicken Salad and the Peanut Butter Cups which were both so delicious. The recipes are not too complicated and are very tasty. 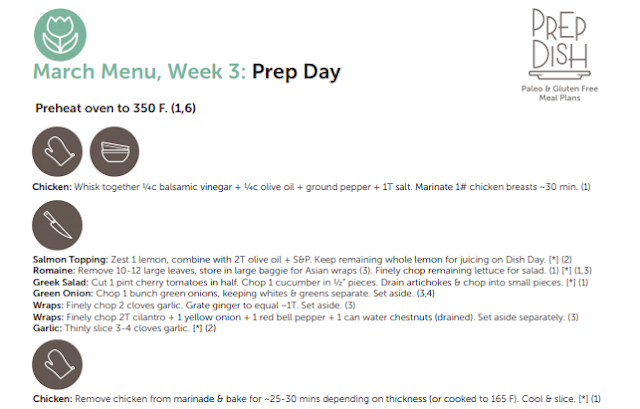 My thoughts on the service is that it can be very helpful for those who need help meal planning. As a dietitian, the most common question that I hear is "Can you make me a meal plan?". So I know that people are looking for meal planning help! To get the recipe for the Greek Chicken Salad, visit the recipe on the Prep Dish site. Find the recipe for the Peanut Butter Cups here. You can subscribe monthly to Prep Dish for $14 a month or yearly for $99 a year. A premium subscription is $149 a year. Each Friday, you receive a newsletter with links to your meal plan, recipes and tips to help you succeed. Enjoy! ***When you sign up for Prep Dish by using this link, you can get a FREE 2 week trial of Prep Dish! This post is sponsored by Prep Dish.